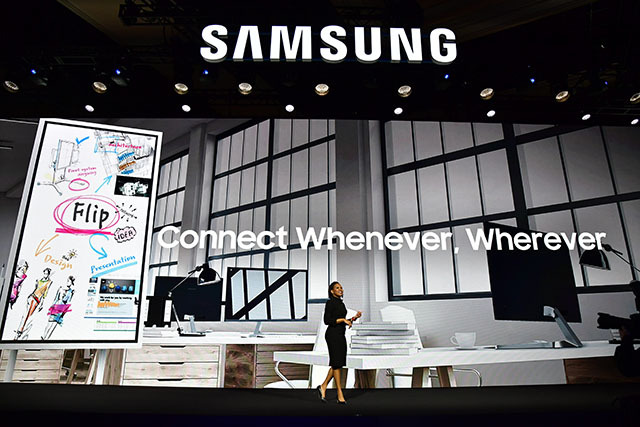 Samsung took to the stage at CES 2018 to announce a slew of new products and the company’s roadmap for the future. 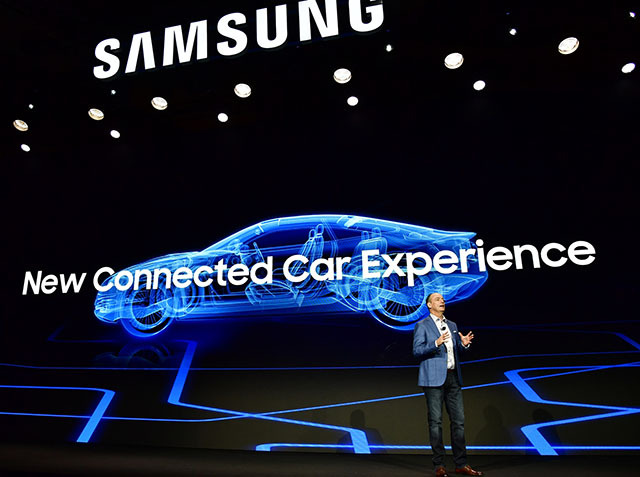 The press conference was presented by the company’s president Tim Baxter, who showed off Samsung’s advances in the field of IoT, TVs (because, Samsung, duh), and autonomous, connected cars. Here’s everything the company announced and showed off at the world’s largest tech-conference. Samsung is going to integrate its SmartThings platform into everything the company touches. With this, the company aims to allow users to control all of their SmartThings connected smart devices from anywhere — cars, smartphones, that new refrigerator it just announced, and more. For example, you’ll be able to ask Bixby on your Samsung refrigerator to show you some recipes, or mirror your Samsung Smart TV while you’re in the kitchen. The possibilities are endless, provided your house is filled with everything Samsung. Otherwise this’ll be just as broken and fragmented an experience as it has been thus far. Samsung teamed up with Harman (a company it owns now) to leverage Harman’s Ignite Platform in order to create connected cars of the future. The cars will be able to customise their dashboards and integrated infotainment systems according to the driver’s and the passengers’ individual needs through virtual assistants, AR, and more. Plus, users will be able to control their SmartThings IoT devices from their car. So you could heat up your home before you arrive, start your smart speakers to set the mood when coming back from a romantic dinner. Samsung’s got your back. Samsung also announced the ‘Samsung Flip’. It’s not a flip phone. This is a whiteboard on steroids. It’s a lot like Google’s Whiteboard. The ‘Flip’ allows up to four people to simultaneously make edits to the stuff being displayed on it. It connects to your smartphone or PC to directly mirror information, and teams can work together on it in the traditional ‘pen and paper’ format. The ‘Flip’ also comes with an integrated screen sharing technology, so everything on the whiteboard is displayed on connected devices, without any loss in quality. 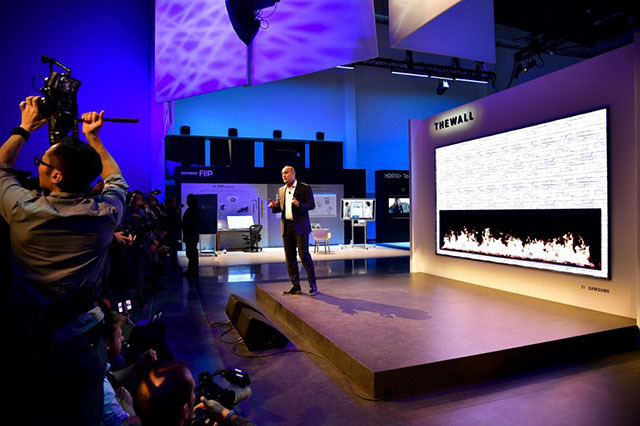 ‘The Wall’ is Samsung’s new, modular, MicroLED TV that’s a massive 146-inches in size — hence the name. According to Samsung, MicroLEDs allow the TV to require no backlighting, resulting in OLED-like performance in a slimmer form factor — so that’s great. Plus, the TV is modular. It’s not clear how, but Samsung says users will be able to adjust the size of the display according to their needs, and the size of their room. That was it for Samsung’s press conference at CES 2018. A lot of cool stuff in IoT, and a lot of pixels on that 146-inch TV was on display today. The Consumer Electronics Show runs from January 9 to January 12, and we’ll be bringing you regular updates on everything that’s going on, so keep checking back here for the latest news.